WASHINGTON (CNS) — In an effort to help lay Catholics gain a deeper understanding of religious life, priests, brothers and women religious intend to open their convents, monasteries, abbeys and religious houses to the public one day next February. “If you’ve ever wondered what a brother or religious sister does all day, you will find out,” said Dominican Sister Marie Bernadette Thompson in announcing the open house scheduled for Feb. 8, 2015. The open house is just one of the events for the upcoming Year of Consecrated Life, which begins the weekend of Nov. 29-30 — the first Sunday of Advent is Nov. 30. It will end Feb. 2, 2016, the World Day of Consecrated life. The special year dedicated to consecrated life was announced by Pope Francis and is similar to previous themed years announced by popes such as Year of the Priest (2009-2010) or Year of St. Paul. (2008-2009). 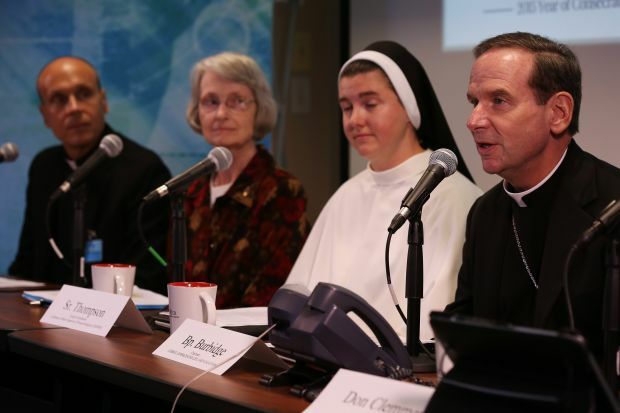 Bishop Michael F. Burbidge of Raleigh, North Carolina, chairman of the U.S. Conference of Catholic Bishops’ Committee on Clergy, Consecrated Life and Vocations, announced the Year of Consecrated Life events at an Oct. 1 news conference at the USCCB headquarters in Washington. He said the scheduled events will provide an opportunity, especially for young people, to see how men and women religious live. He also urged heads of religious orders to let his committee know of activities they are planning so they can be publicized. Sister Thompson, council coordinator of the Council of Major Superiors of Women Religious, said the purpose of the open house gatherings will be to provide people with an encounter with men and women religious and also an encounter with Christ. Sister Marcia Allen, a member of the Sisters of St. Joseph of Concordia, Kansas, and president-elect of Leadership Conference of Women Religious, said another initiative for the upcoming year is called “Days with Religious,” during which laypeople will have opportunities to join men and women religious in works of service throughout the summer of 2015. She said these opportunities, to be announced locally, will not only give laypeople the chance to “work with us side by side” but will also enable them to become aware of the charisms of different orders. Sister Allen said she hoped the experience would be a “coming together for the sake of the church’s presence” in the modern world. The third major initiative for the year is a day of prayer scheduled Sept. 13, 2015. “We will join hands and hearts with you that day,” said Father James Greenfield, president of the Conference of Major Superiors of Men, who noted that throughout that day people will be invited to join religious men and women for vespers, rosary or holy hours. Although the year’s events are intended to give laypeople a deeper understanding of consecrated life, the men and women religious also said they will most likely benefit. Sister Thompson said she hopes women religious experience a renewed joy in their vocation and Sister Allen stressed that by simply explaining their order’s charisms to others should give the sisters a deeper understanding and appreciation of their ministries. “Whenever you think you are giving something you always end up receiving more,” she said. Prayers intentions, prayer cards, a video on consecrated life and other resources are available at: www.usccb.org/beliefs-and-teachings/vocations/consecrated-life/year-of-consecrated-life/index.cfm.